This is the long tab for the f/c toe pedal bellcrank. The throttle cable attaches to this tab. 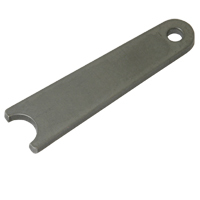 The base width of the tab is 5/8" and the hole size is 3/16". The thickness of the tab is 0.125" and the height of the center line is 2.156".